Lesson 6 (CC2 level) - The Chip's Challenge Wiki - The Chip's Challenge Database that anyone can edit! 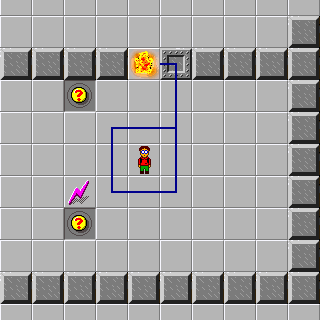 Lesson 6 is the 60th level in Chip's Challenge 2, and the sixth of the lesson levels. It was created by Chuck Sommerville. When you have the lightning bolt, standing on a wire turns the wire on. Remember that wired flame jets change state when their input goes from off to on. Monsters can eat blue keys. In this room you will have to race a monster to pick up a blue key. You will not be fast enough to pick up the key without these speed boots. When you step on this trap release, the race is on. These on/off switches can send power down the wires they are attached to. Red teleports that are wired can be turned on and off. 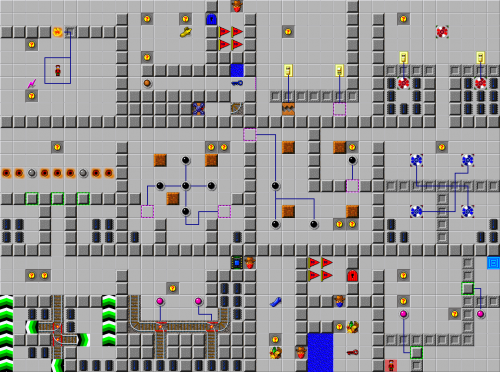 When blue teleports are wired together, you can only exit other teleports on the same circuit. The black button output is always on, unless it is pressed. You must turn off the power from all buttons attached to a wire for the wire to turn off. Push these 3 blocks onto the 3 buttons to turn off the power to the purple toggle door. The vertical and horizontal outputs of black buttons are on separate circuits. Line these 3 blocks up vertically, then again horizontally. The grey buttons change the state of things in a 5 by 5 square around them. When there is a red dot on a train track junction, it becomes a switch. Track switches change every time something goes over them. When a track switch is wired, it changes state when its input goes from off to on. This is a thief bribe. if you have it, the thief will take the bribe instead of your tools. Here is another thief bribe to keep you from losing your red key. This room has a mirror Chip. he will move anytime you move. he follows your lead. This button will release the mirror chip from his tiny cell. Try to get the mirror chip to step on this button so you can exit.